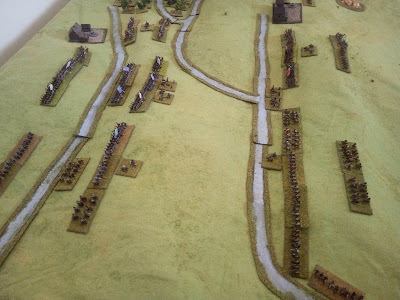 Please see here link for an AAR of my refight of the Battle of Oldendorf from the Thirty Years' War, using Baccus 6mm figures and the Twilight of Divine Right rules. Thanks for the post. Your making me want to get my stuff on the table. Just curious, I assume that each 'unit' is represented by 1 stand and therefore a 'BW' is considered to be 1/2 the width of the bases? Yes. I use a single base using the Polemos standard 60mm x 30mm to represent a unit, the authors use two bases of that size to represent a unit. So where the rules say 1 Base Width, I read 1 Base Depth. It works fine generally, although some of the ranges are very short! As a solo player not a problem at all, in a face-to-face game one would need to be careful, I think.